Udaipur, also known as the City of Lakes, is a city in Rajasthan which is famous for its lakes, royal residencies, and gardens. It’s a great place for weddings, exploring or a family holiday. If you happy to be in the city for any of these reasons, be sure to save a few days to have a picnic. We list the best places in Udaipur to spend a relaxing few hours or even a day. While Chandni Bagh is a calm place, Rajiv Gandhi Park is a perfect picnic place if you’re looking for some easily-accessible outdoor fun. This place is ideal if you have kids. Rajiv Gandhi Park is full of gardens and fountains. There are various outdoor games and boat riding as well. This well maintained park also has food stalls so don’t worry if you forget to pack something to eat. Originally a courtyard for Udaipur queen and her royal ladies, Saheliyon Ki Bari is the best place if you want to spend some time with your family. The whole courtyard is covered with countless fountains, trees, and statues, which is like something out of a Bhansali movie. There’s also a museum in the courtyard which houses many statues, paintings and stuffed animals which may interest those who are interested in history. Also known as the Pearl Hill, this place gives you the best aerial view of Aravali Range and Fateh Sagar Lake. A favourite with the locals, Moti Magri is just breathtaking thanks to its scenic beauty. 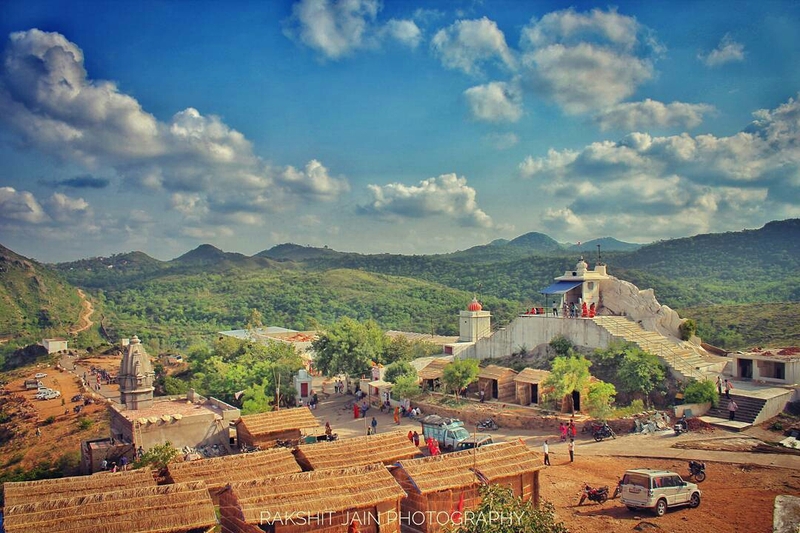 This place is situated on top of a hill and built as a memorial of Maharana Pratap. There’s also a museum here which tells the stories and significance of Rajput history, Haldi Ghati battle and Chittorgarh Fort. As the sun goes down, light and sound show here is a special attraction. 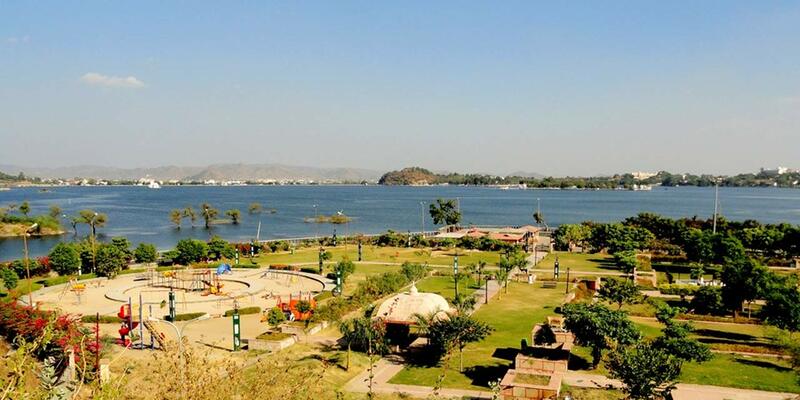 MLV park is another exotic picnic place in Udaipur. Situated near Dudh Talai Lake, this park has lush green gardens, fountains, slides and many other attractions which make it a perfect picnic spot. Evenings are the ideal time to visit this place as you can go on a pleasant boat ride while watching birds. There’s also a rope-way to the nearby Karni Mata temple. Other attractions include a musical garden and an evening fountain show. The Fateh Sagar Lake is another favourite place among the locals and visitors. This is the second largest lake in the city and was built by Maharana Jai Singh in the year of 1678. There are three islands on the lake which can be reached by boats and these islands can be brilliant picnic spots. The largest of the islands is the favourite and also has a boat-shaped restaurant. There are boat rides, a small zoo, jet fountains and many gardens which make this spot great for a picnic with the family. Situated along the banks of Lake Pichola, the City Palace is a one-of-a-kind royal picnic spot in Udaipur. Many Bollywood and regional movies have been shot here, against the backdrop of the palace’s stunning architecture, which is a combination of Medieval, European, and Chinese design. Other key attractions of the City Palace are its rich lawns, Vintage Car Museum, Maharani Palace, Daawat-i-Aam, and Daawat-i-Khas. Do not miss the light and sound shows that begin in the evenings. This is another peaceful picnic spot in the surroundings of Udaipur city. Situated in Thoor Village, Thoor Ki Pal is a much visited place in monsoons thanks to its waterfalls and a serene horizon. Make sure you wear some comfortable footwear and go with surplus food and water supplies as the place is a bit remote and there may not be many shops for foodstuff. This religious place is also a good picnic spot. The rocks here create miniature pools after it rains, attracting people who come here to splash around. The water streams which flow near the temple lend a pleasant vibe. Make sure you pack food and beverages as getting snacks and drinks can be hard in this area due to the lack of stores. This place, situated on the outskirts of Udaipur, is an enchanting location with streams, green trees and a peaceful environment. If you want to get away from the everyday hustle and bustle of the city for a while, Chandni Village is the ideal picnic spot for you. The local villagers here are also so welcoming and will help you out with things. However, as a picnic demands, carry some carpets or mats to sit on as there’s no plain ground here, just woods. Ubeshwar Ji is a religious place which is mostly crowded in the monsoon, as the rain elevates its beauty. Along with waterfalls, mountains and greenery, this place also houses a temple dedicated to Lord Shiva. Surrounded by the Aravali Mountains, this place is a much loved picnic location thanks to its ponds and natural beauty. Set up your picnic near the pond and don’t forget to carry floor mats or foldable chairs with you. 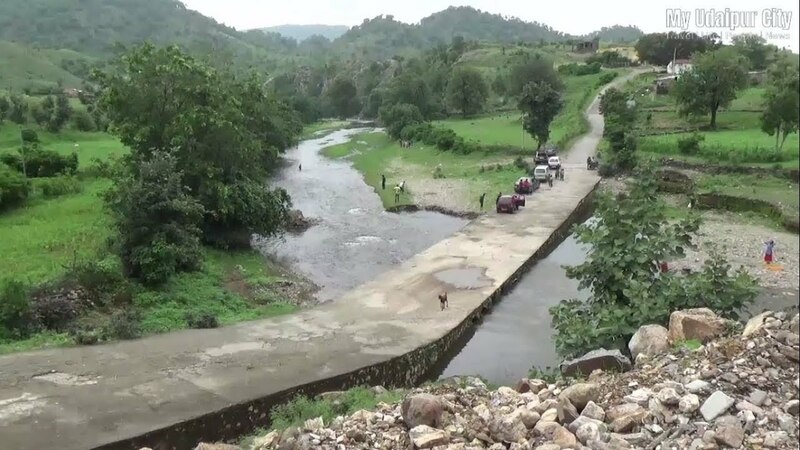 Tidi Dam is another waterfall destination which is a superstar in the monsoon season. 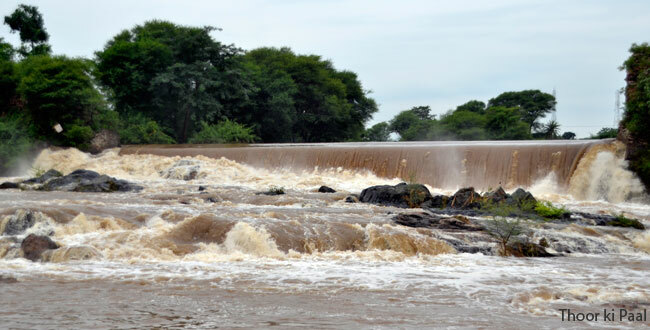 Many visitors come here to get drenched under the overflowing water from the dam. Make sure you are careful to avoid pointy rocks under the water while you are splashing around here. And do not try to climb on top of the dam as it is slippery and very dangerous. Previously known as Dhebar Lake, Jaisamand Lake looks like something out of a bond movie shot in Monaco or Greece. This enormous water stretch includes 11 miniature islands, and a big walkway. One cannot explore all of Jaisamand Lake in a single day as it is huge. There are many marble cenotaphs on which you can set your picnic. Also, don’t forget to take a picture on the marble elephants. 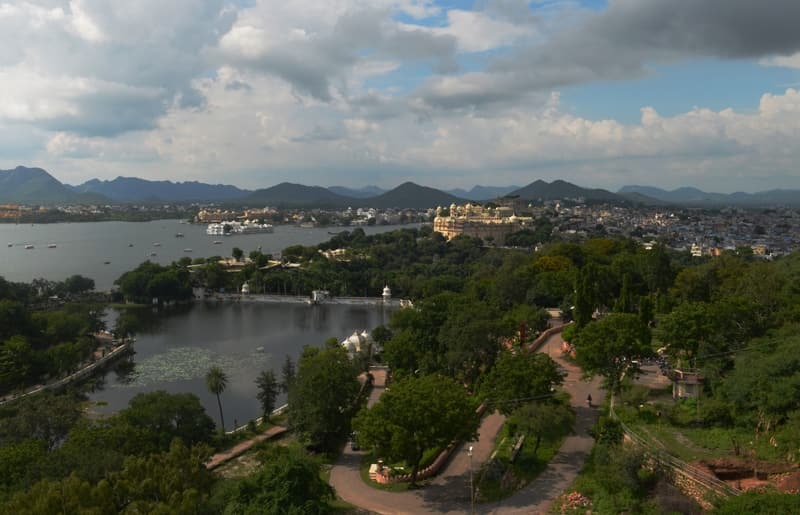 Udaipur is all about its lakes, royal architecture, gardens, and waterfalls. No other place in India can give you that regal feeling that Udaipur offers. Roaming around the city itself gives you an aura of long gone but not forgotten history and stories. For a great picnic outing in the city, make sure you visit some of the places that mentioned above.